This property is situated in a small hamlet on top of a hill surrounded by the wilderness of central Portugals pine and eucalyptus forest landscape. It is only a stone throw away from natural river beaches, hiking tracks and fishing spots. The wooden flooring of the property allows for an easy conversion, incorporating the basement area into the living quarters. The property benefits from a recently built drive, allowing for car park space up to 2 cars. The current living quarters are on the first floor which comprise of a bright reception room with a large original all fireplace, leading on to a sitting room which in turn provides access to 2 bedrooms and a hallway leading on to the bathroom. At the front entrance is a porch area which also provides access to an external kitchen, which was more recently built. The land is suitable for growing vegetables, has got some established fruit trees, has a well for irrigation and stunning views over the countryside. The property is situated in a rural location though is only a short drive from most amenities. The closest village Pelma is only 3 Km away. The property is accessed via a cobbled lane and there are only 2 or 3 neighbouring houses near by. 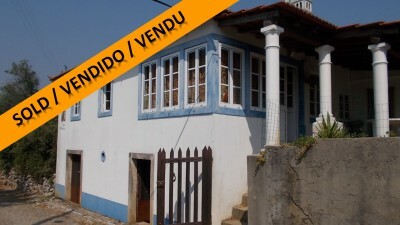 The closest towns to the property is Alvaiazere and Freixianda which are within 10 and 5 minutes drive. Both towns have all the basic amenities. The historic town of Tomar, which is home to the UNESCO listed Convento do Cristo, founded by the Templar’s crusaders is only 30 minutes’ drive from the property. All major European high street shopping is also available in the city of Coimbra the 3rd biggest city in Portugal which is only 55 minutes’ drive on the A13 motorway.